Our portable billboards offer great branding for outdoor events. 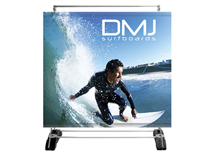 These large graphic displays will make an impact and are also easy to transport! 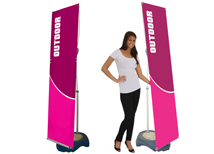 Outdoor displays can also be used indoors for trade shows and events. We use 13 oz. outdoor grade vinyl on our banner stands for durability and longevity. Wind slits can be utilized to make the banner even more wind resistant. Turnaround time is only 3 business days so any of these banners can be ready on short notice! The Spinnaker outdoor billboard is a favorite because it’s adjustable and also has large bases that can be filled with water for stability. It can support up to an 8’ x 8’ graphic and is available single or double sided. 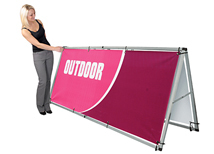 This is one of the few portable outdoor products that can support such a large banner. 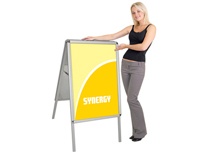 It’s commonly used for fairs and events but can also be utilized as a store front display or large sidewalk sign. Replacement graphics are available at any time to keep branding fresh and current. The Monsoon is another great sidewalk sign that is oversized for maximum attention. It’s very effective for churches and other religious organizations that have large services. 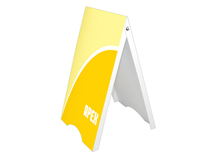 It works great as a directional sign and can be single or double sided. It’s easy to assemble and store which makes it great for companies that only need to use it for a couple days or short periods of time.